Patty Carson, I am sad to announce, passed away early in 2019. Her contributions to living-pterosaur investigations have been great, for she has spoken freely about many details that she observed in the flying creature she encountered in Cuba in about the year 1965, when she was a little girl. She also gave us a remarkable sketch, drawn from her memory of that ropen. After an introduction to Patty’s sighting of the ropen, the mood changes as the U.S. Marine Eskin Kuhn is shown to be a second eyewitness at Guantanamo Bay. 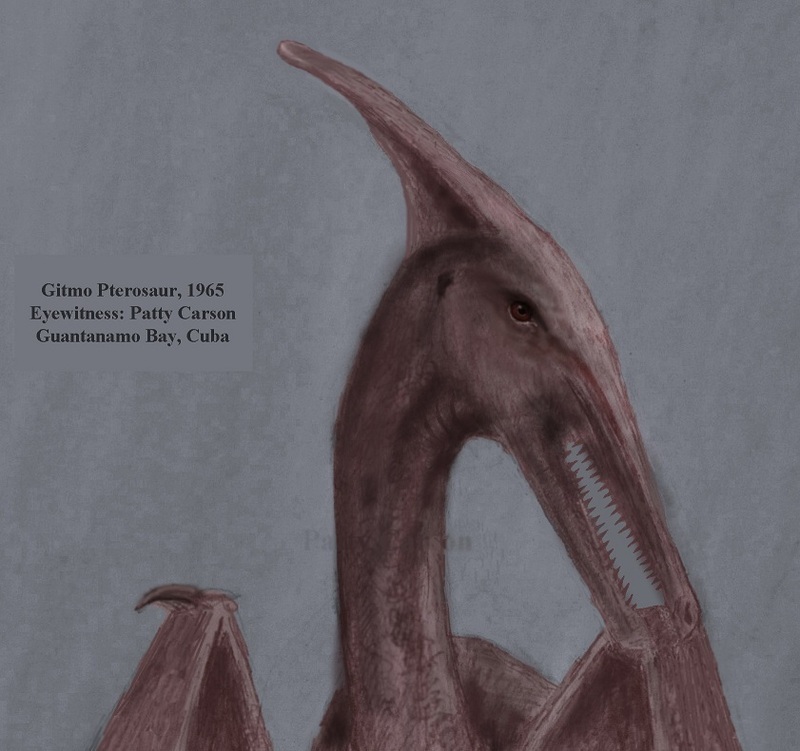 He saw two “pterodactyls,” also in clear daylight, but he drew his sketch within minutes of his encounter with those flying creatures; Patty drew her sketch decades later, in 2011. The two sketches are then compared, in particular with a difference in the depiction of the head crest. The mini-documentary then points out that two legitimate sketches of a real animal would not be expected to be nearly identical anyway, and the actual difference is shown to be minor. The scene soon changes to Australia, where a couple in Perth saw a gigantic flying creature in December of 1997, between the neighborhoods of Heathridge and Ocean Reef. The words of the lady and her scientist-husband are then presented. Duane Hodgkinson’s sighting in 1944 is then briefly explained (Finschhafen, New Guinea), and the scene changes to the two ropen expeditions on Umboi Island in 2004, although that is also only briefly mentioned. Approaching the end of this 16-minute mini-documentary, sightings of apparent pterosaurs in the United States are display but without any details about those encounters. The names of the American states are displayed over a map of the country (map of the 48 Contiguous states). This refers to many books, each of which has at least a little information about modern pterosaurs, and some of these are entirely about those flying creatures. Look not to a biology professor at a university, if you should be one of the lucky ones who has seen an apparent living pterosaur in states like South Carolina, Georgia, Virginia, or North Carolina (or any other state or country). Contact me to report the flying creature you encountered. One of the first detailed pterosaur sighting reports that I received from a state of the USA was the encounter by Susan Wooten in South Carolina. It seems to have been a large ropen. The following is from the first chapter of the third edition of my nonfiction book Live Pterosaurs in America . . . 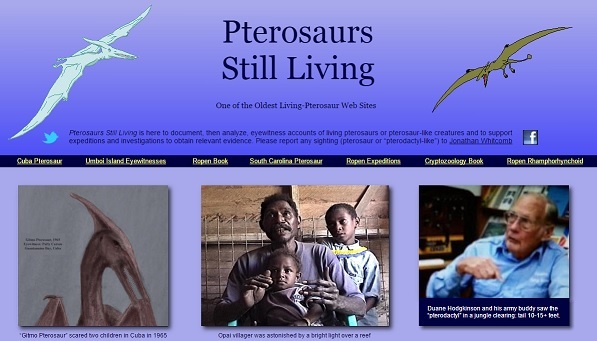 Which two nonfiction writers have dominated the field of living pterosaurs, at least in the volume of paragraphs published online? A casual search will reveal that Glen Kuban and I, in our combined writings, appear to dominate all other online writers in the world combined. A passion for writing on reports of non-extinct “pterodactyls”—that is what we have in common. We also have both stated that the official scientific discovery of a species of living pterosaur would be a wonderful event. But the value we place on the overall eyewitness reports of modern pterosaurs—that is about as different as can be imagined. We agree that a 19th century newspaper account of an ancient flying creature stumbling out of a tunnel in France should not be taken seriously, but we agree on little else. Be aware that I am not criticizing his motivations, and I do not imply that 100% of his writings on reports of living pterosaurs are completely worthless. I do suspect that a large part of his writings, however, may do more harm than good for the progress of real science, notwithstanding he thinks that he is protecting sound scientific practices. Over the years, Kuban seems to have purchased one of each of those books from Amazon. For each of those books, he has written a long, very negative comment. He has a right to his own opinion, but some of what he writes on those Amazon pages is about things that are not actually in the books in question. Take The Girl who saw a Flying Dinosaur. This is for children and young teenagers. Obviously Mr. Kuban did not purchase a copy of this book for his own enjoyment. He spent his own money on it, so he has a right to publish his opinion about it. Yet an average reader of that book review can be completely mislead by it.
. . . many young-Earth creationists (YECs) such as Whitcomb often disregard this, however, Whitcomb’s claims are not even endorsed by any major creationist . . . group . . . In other words, Glen Kuban appears to be attacking me, or at least criticizing me, on a subject that is outside the book. I thought that a book review was supposed to be about a book. Beyond that, however, he declares things that are simply false. For example, he refers to a six-year-old girl who encountered what she declared was a “pterodactyl.” That little American girl is where the book gets its title: The Girl who saw a Flying Dinosaur. But Kuban calls her a “Cuban” girl. Perhaps that’s no big deal, for Patty’s family was living at Guantanamo Bay, Cuba, at the time. But there’s more. He points out that the little girl did not draw a sketch of the flying creature until decades after the sighting. I see the point. Maybe some kind of mistake was made because of that. But consider the second chapter of the book: “A Sighting by a U.S. Marine.” Eskin Kuhn saw two “pterodactyls” at Guantanamo Bay just a few years after the sighting by the little girl, and he drew his sketch within MINUTES of his encounter. Nothing is mentioned in Kuban’s book review about Mr. Kuhn. Nothing is said about that sketch, which is obviously of the same kind of flying creature sketched by Patty Carson, when we consider that both sightings were at Guantanamo Bay. I could go on, for Glen Kuban has made many mistakes and errors of judgment in his review of my book The Girl who saw a Flying Dinosaur, but I’ll leave it at that, for now. Please consider the following, before I respond to a small portion of the negative comments that Glen Kuban has made about my writings. Not all of his writings are about me or my publications, but many of them are. Kuban, during the years that he has published online criticisms of eyewitness accounts of living pterosaurs, has never interviewed even one eyewitness. His general practice is to take what he finds online or in books and, without asking me for clarifications, he then finds anything and everything that he thinks might discredit the sighting; then he publishes it. That is what his tens of thousands of words have shown to me. This is for middle grade and young-teenage readers, this nonfiction about non-extinct pterosaurs that appear to eyewitnesses worldwide. Glen Kuban and I completely disagree on the value of eyewitness testimonies of flying creatures that have been reported to me as living pterosaurs, what some people call “pterodactyls” or “flying dinosaurs” or “dragons.” He has spent years trying to convince people that all the testimonies are of no value; I have spent years writing books and online publications explaining why some of them are of great value. 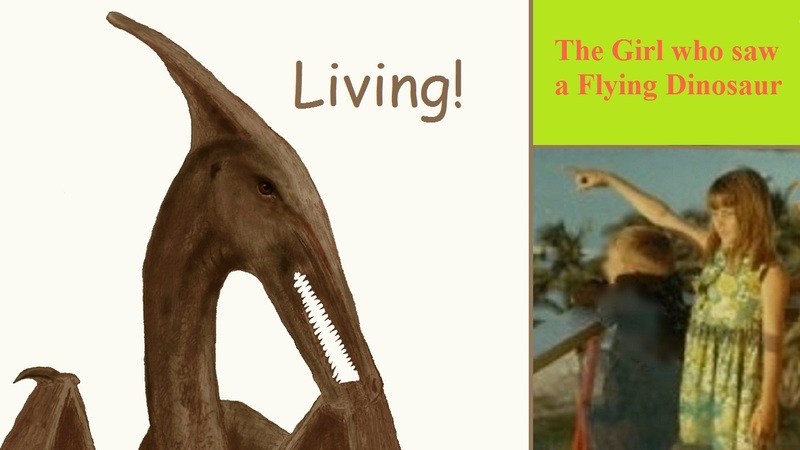 I write books about flying creatures whose descriptions suggest living pterosaurs. In general, most of the reports that get to me appear to actually have been from those non-extinct pterosaurs, strange as that may sound to many people. That strangeness may sometimes be a problem. For those new to this blog, a pterosaur is not actually a “flying dinosaur,” although many Americans call it by that incorrect name. It is a featherless non-bat flying creature. People several centuries ago probably mostly called them “dragons.” The big problem with the strangeness of one of those words or the phrase “flying dinosaur” is this: When a community or neighborhood might potentially be in danger, how do you warn them about a large ropen? It’s just too easy for anyone ignorant of those animals to assume the person reporting one is crazy or a fanatic. This morning I interviewed, face-to-face, an eyewitness of an apparent living pterosaur that flew over his backyard in Draper, Utah, on Sunday, November 4, 2018. He seemed perfectly credible to me, and I also talked with his wife and found nothing wrong with her deportment. The creature flew over their backyard at about 5:30 p.m., on Sunday, November 4, 2018, at a height of possibly less than 50 feet at one point. The closest it came to the man, in horizontal distance, may have been about 85 feet. The wingspan seems to have been between about 16 feet and about 28 feet. Those wings had a very uneven shape to them in the trailing edge. Other eyewitnesses have reported a similar flying creature in western Draper, the other encounters being about two miles away in the year 2017. On June 26, 2017, my wife and I met with several eyewitnesses in a neighborhood of Draper, Utah, (in the southern part of the Salt Lake Valley) a few miles west of the Wasatch Mountains. Each of the four persons we talked with lived within about 300 yards of each other and a little south of the Swire Coca Cola complex . . .
To precisely judge what might be the best Christmas (or birthday) gift for a ten-year-old girl requires knowing the interests of that child. If you’ll excuse me for promoting my own book, however, please consider my new nonfiction The Girl who saw a Flying Dinosaur. It’s for middle-grade children and youth up to about fourteen years old. A native village leader on Umboi Island, Papua New Guinea, encountered a strange light shining down on him as he was in a canoe, over a reef at night, while his buddy was underwater trying to catch fish with a flashlight.
. . . we stared up at the night sky . . . [My brother] suddenly noticed something and started yelling something about a giant bird . . . At around the same time, the animals in the farm next to us started going berserk. . . . Suddenly as I looked up at the night sky, the farm animals started up again and then I saw it. The “pterodactyl attacks” do not seem to come just from the imagination of the author of Bird From Hell, although he displays a keen sense of imagination in his writing (not necessarily in any negative sense of “imagination”). He reports quite a few cases in which residents of a sparsely-populated area of British Columbia have been attacked at night by a large flying creature. A limited revision of Searching for Ropens and Finding God, the fourth edition, does include new material at the end of the appendix, an interview I had with Professor Peter Beach and with the nonfiction author Milt Marcy. 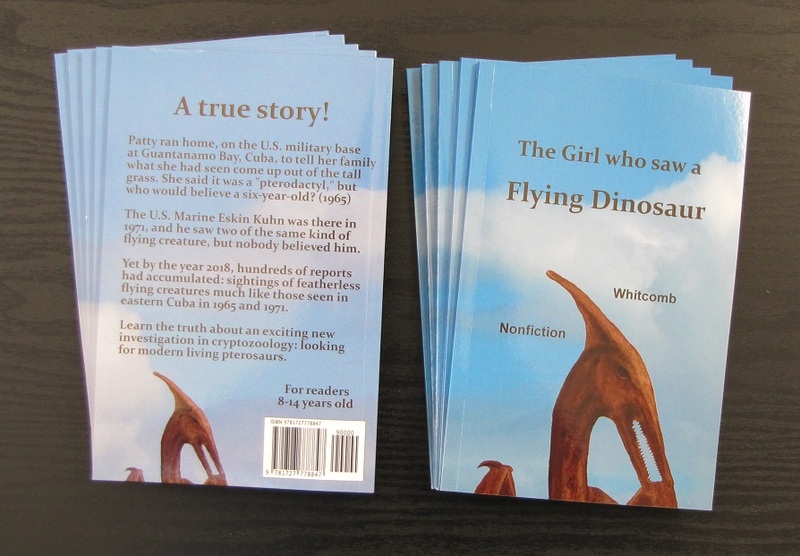 I wrote the nonfiction book The Girl who saw a Flying Dinosaur for several purposes. As a gift giver for a child or teenager, you need to know what benefits it can give to the young reader. I recommend it for readers between about the ages of eight and fourteen; for some ten-year-olds (and eleven and twelve) it will be exceptionally delightful: easy to understand yet stimulating. The Girl who saw a Flying Dinosaur can help a young developing mind to think critically and objectively, which can help to prepare that young person for a possible future as a great scientist. This book is not, however, for a reader who simply wants to sit inside the same box forever, never to become an important leader in science. It’s not a book that indoctrinates the reader, telling her or him what to think. The Girl who saw a Flying Dinosaur helps the young person to examine what people actually experience in the real world and what it might mean, in spite of the potential shocking consequences. In other words, if you the gift-giver and the young reader want only to be told the same old tale about universal extinctions of all dinosaurs and pterosaurs, then this book is not for you. The Girl who saw a Flying Dinosaur does not indoctrinate with ideas from the late 1700’s and the 1800’s, like so many nonfiction science books do. 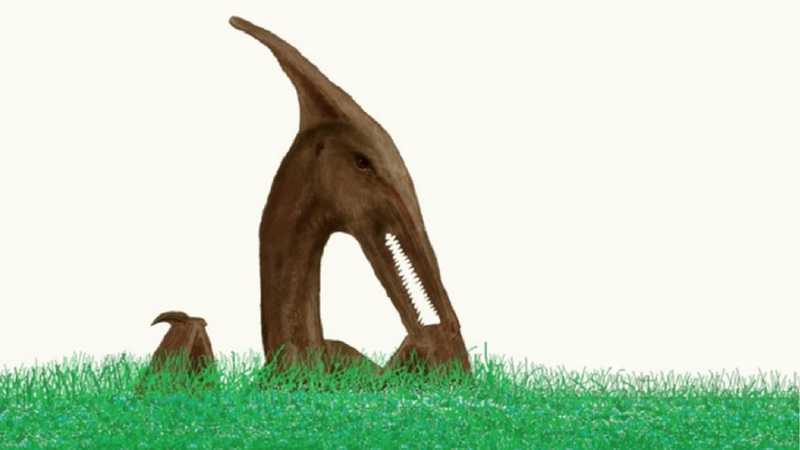 It explains why scientists from old times could have been mistaken about universal pterosaur extinction. What a treasure this short book can be! It’s not about how they all died many millions of years ago or about why they all died. It’s more like a true-life adventure, getting into eyewitness testimonies from men, women, teenagers, and children, common people from two continents. This book explores what they actually saw, or at least what they tell us that they saw, and why we can learn from the many similarities in the reports: what the animals look like, or at least what they’re reported to look like. This book explores why people did not believe eyewitnesses at first and why people are beginning to believe them in recent years. Indeed, some cryptozoologists are completely convinced that many eyewitnesses have given us reports that deserve serious scientific investigation. I am one of those cryptozoologists: I believe what many eyewitnesses have told me. Again, the reader can decide what to think. Unlike almost all nonfiction books on dinosaurs and pterosaurs, this one does not indoctrinate readers into what to think. It reports what three eyewitnesses said about flying creatures in Cuba (1965 and 1971) and compares those accounts with others: four eyewitness accounts from Los Angeles County in the 21st century and seven eyewitness accounts from Papua New Guinea. Please do not misunderstand what this book suggests. From the many species of pterosaurs that are now known to many scientists through fossils, it is obvious that countless species of this flying creatures have lived in the past. The Girl who saw a Flying Dinosaur suggests that one long-tailed species has survived and that this uncommon nocturnal animal has avoided official scientific discovery partly because it rarely appears in daylight. Unfortunately for eyewitnesses, when such an animal is reported and described, almost nobody believes it . . . until recently.
. . . One day in 1965, a few children were walking near some tall grass in eastern Cuba. Patty was about six years old and was with her little brother. Suddenly an animal stuck its head up above the grass, about thirty feet away from Patty. As the children looked at the animal, nobody moved. Not just the head but the upper part of the wings were showing. It looked confused, like it had just woken up and was looking around to see what was happening. After about five seconds, the creature jumped up and flew away. It had a leathery brown coloring, with no sign of any feathers. The end of its long tail was diamond shaped. Six years after Patty saw the flying “dinosaur,” a United States Marine saw two “pterodactyls” at Guantanamo Bay. Most people did not believe him. It’s not just children that have that problem, for many people believe that all of those flying creatures became extinct many millions of years ago.
. . . The two pterosaurs flew together, slowly flapping their wings. They were not far from Eskin and maybe 100 feet high. He described their wing flapping: “graceful.” He had a clear view, as they flew from the sea, going inland. Wingspan is the distance from one wingtip to the other. Eskin thought the two pterosaurs each had a wingspan of about ten feet, but he said that it could have been as small as eight feet or as large as twelve feet. It’s hard to tell how big something is if it’s up in the air and you have never seen anything like that before. 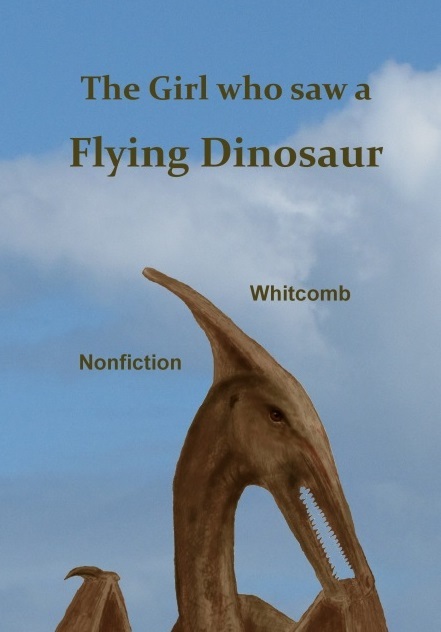 I would here be writing mostly about those interviews in 2004, except that I’ve just started a new nonfiction cryptozoology book for children: The Girl who saw a Flying Dinosaur. That’s why I need to concentrate on two pterosaur sightings in Cuba . . . The “flying dinosaur” of Papua New Guinea is often called ‘ropen.’ It seems to be a large Rhamphorhynchoid pterosaur, far larger than any of the fossils of those long-tailed Rhamphorhynchoids known, at least into the beginning of the twenty-first century. I don’t accuse all ropens for all the disappearances of children who go missing in North America. But the reported sizes of some of these flying creatures makes it possible for a small number of them to go bad in the worst way, like a few mountain lions and a few bears that we have heard of over the decades. Since the time of Darwin, many scientists have assumed that some general types of animals became extinct long ago. One of the assumptions is that all species of dinosaurs and pterosaurs died off before any humans existed. Wesley Koro, Gideon’s brother, was one of seven boys who saw the ropen fly over a crater lake on Umboi Island (about 1994).
. . . some of the nonfiction books are entirely about these featherless flying creatures and others include cryptids of other types or even are mostly about paranormal events in general . . .
. . . last weekend two of my children were playing in the garden . . . around 10 a.m. [and] my son of 13 years came running in to me saying he saw a giant big brown bird with giant wings. . . . I sometimes encounter the word dragon, in my communications with eyewitnesses of apparent living pterosaurs, but rarely encounter or use the phrase “flying snake,” unless it’s in reference to the fiery flying serpent in the Bible or in the Book of Mormon. 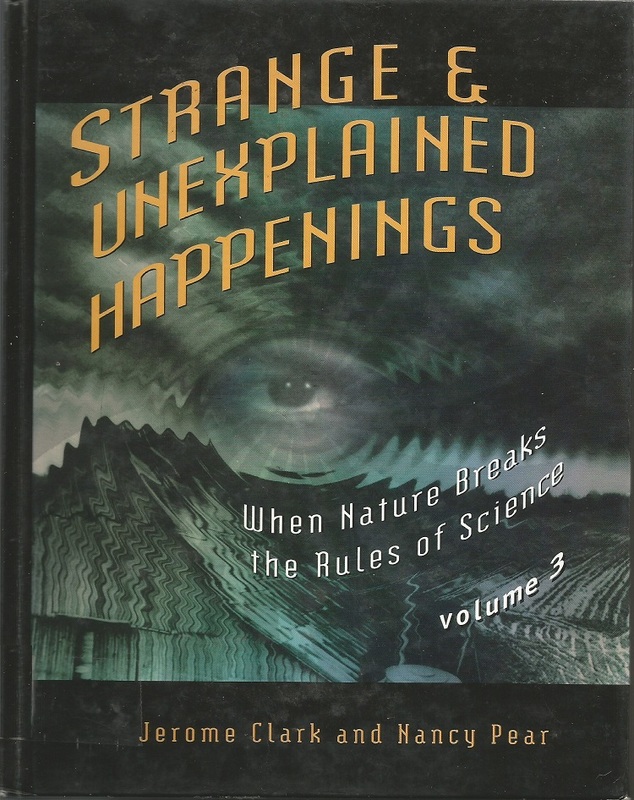 We now look at a chapter in the book Strange & Unexplained Happenings, Volume 3, by Jerome Clark and Nancy Pear, with subtitle “When Nature Breaks the Rules of Science” (International Thompson Publishing, 1995). Red signs appeared in the sky after sunset, and horrid serpents were seen in Sudsexe*, with great amazement. . . . [19 years later] exceptional flashes of lightning, and fiery dragons were seen flying in the air . . .
*”Sudsexe” is the ancient word for Sussex in England. Yet glowing dragons and reports of flying snakes are not confined to English folk tales and legends from many centuries ago. We also find, in Strange & Unexplained Happenings, an account of a strange flying creature in what is now southern Namibia, and this was investigated by Marjorie Courtney-Latimer (sometimes with the spelling Courtenay), famous for her discovery of the living coelacanth in the early 20th century. A farmer sent his 16-year-old son to investigate why he heard reports of a large flying snake in nearby mountains, for native shepherds had gone on strike because of it. The boy not only had his own encounter with the creature but was rendered unconscious as he noticed a strong odor after the huge flying “snake” had landed. I suspect he encountered a large ropen, what my associates and I believe is a long-tailed modern Rhamphorhynchoid pterosaur. In 2011, I communicated with a man who reported recently observing an apparent living pterosaur in Windhoek, Namibia. It appeared to be about half the size of a private airplane and seemed to be devoid of the primary feathers which are commonly seen on the ends of the wings of large birds. 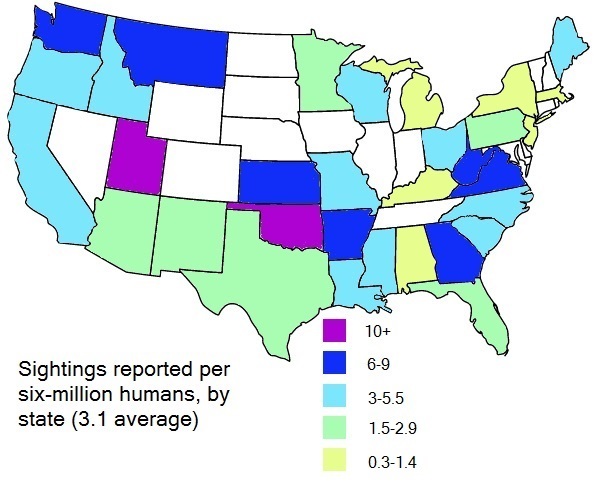 The descriptions of the flying creatures led me to believe that they had seen living pterosaurs, even when some of the sightings were in populated cities in Southern California. These animals are not at all confined to ancient legends or in remote wildernesses where people rarely venture. They fly whenever and wherever they chose to fly, although they are generally mostly nocturnal. Both grandmothers and wolves are actual living beings of this world, even though the story “Little Red Riding Hood” is a fictional story. In a similar way, old legends need not be 100% fictional. People in North Carolina, and in other states of the USA, need to know that these sightings are taking place. The Bible mentions fiery flying “serpents” as real animals, causing death to many of the people of Israel in the desert many centuries ago.